KIEV, Ukraine -- Few politicians in the world have had to undergo the same experience twice in their career and in different countries. Yet this is exactly what happened to me in Ukraine and Georgia. The former Georgian president Mikheil Saakashvili at a news conference in Kiev this month. I was the president of Georgia for nine years, during which it went from a kleptocracy and failed state to a country that won international recognition for tackling corruption and became one of the easiest places in Europe to conduct business. Named the world’s top reformer by the World Bank in 2006, Georgia became a flagship among the countries of the former Soviet bloc. After my second presidential term in 2013, I left to pursue academic work in the United States for a time, and then returned to Ukraine — where, as a young man, I had spent several years at Kiev University. Responding to calls from my Ukrainian friends to help apply my experience in government, I arrived along with the wave of enthusiasm for reform that followed the Maidan revolution. I offered to work in Odessa, the largest region of Ukraine. It was highly unusual for a former president of another state to serve as a governor in a different country, but the very fate of Ukrainian statehood was at stake in Odessa. The province was not only riddled with local mafia groups infamous for their thuggishness, but it was also threatened by the conflict with Russian-backed separatists in the east. Odessa borders the breakaway region of Transnistria in Moldova, which is controlled by Moscow-backed separatists and Russian armed forces. I brought with me a group of professionals from my previous government, who started to overhaul Ukraine’s police force and helped to lead the country’s first anti-corruption agency. The reform of the police force was an immediate popular success, while the new anti-graft agency established several high-profile investigations. We seemed to have the encouragement of Ukraine’s president to push ahead. The city of Odessa was recovering from the clashes of May 2, 2014, with pro-Russian militants, in which scores of people were killed. Focusing on reconstruction and reform, I opened a competitive process to recruit the most talented Western-educated professionals to fill the leadership positions in district administrations. I created an economic development board to help local businessmen circumvent crooked officials in state agencies, and I invited Yulia Marushevska, a prominent young Maidan activist, to clean up Odessa’s customs service, which was notorious for bribery and kickbacks. We began a program of repairing roads and other infrastructure. We worked hard to raise standards in public services to new levels and restore security to the region. As the reform movement picked up pace and gained popularity, we suddenly ran into resistance where we least expected it — from people in prominent positions in government back in the capital, Kiev. The first sign of trouble was when I had to confront the then prime minister, Arseniy P. Yatsenyuk, over evidence of corruption involving government officials at a chemical plant in Odessa, one of the largest state-owned enterprises of its kind. Starting in January, I toured the country to publicize our anti-corruption “Cleaning Up Ukraine” movement in order to put pressure on the country’s leaders to put a stop to this graft by Ukraine’s ultrarich. In March, Ukraine’s Parliament voted to remove the prosecutor general, and the following month, the prime minister resigned. Ukraine’s president, Petro O. Poroshenko, pledged to crack down on the old practices and bring in greater transparency. That was more than seven months ago, yet we have not seen any major changes. There was no big clear-out of the cronies. I was left, instead, with the impression that local leaders of the president’s party were working to undermine the anti-corruption efforts. My administration was starved of funding for months, the appointment of several of my key deputies has been stalled, and some of our most able reformers have quit in frustration. Ms. Marushevska, the customs agency head whom I appointed, said she was harassed with trumped-up official reprimands. Similar tactics were used by the prosecutor general’s office, which raided the office of one of my advisers. Despite these aggressive searches, no charges have been filed. The final straw for me came when the online disclosures of Ukrainian officials’ personal wealth, the so-called e-declarations, were published last month. Here were the very public servants with whom I had to work on a daily basis shamelessly declaring the millions of dollars they had stashed under their mattresses. It was the decades-long rule of this post-Soviet kleptocratic elite that turned this potentially wealthy nation into one of the poorest countries in Europe. Ukraine need not be poor, but corrupt officials have systematically pillaged the country, robbing Ukrainians of the prosperity that should be theirs. While Ukraine’s soldiers are on the front line, heroically defending their country from Russian aggression, Ukraine’s elite keeps stripping the country of all it has left. In their lifestyle and mentality, Ukraine’s kleptocrats are identical to their counterparts in Russia’s oligarchy. The final freedom for Ukraine would be to free it not just from Russian aggression but also from the Russian-style political class that holds Ukraine back from its European aspirations. Back in 2001, after failing to persuade Georgia’s president, Eduard Shevardnadze, to force through meaningful reforms and get rid of his corrupt entourage, I resigned from the government. I went on to found Georgia’s United National Movement, which led to the 2003 Rose Revolution, which finally brought real reform to Georgia. The success of Georgia’s revolution served as an inspiration to many of the Maidan activists of 2014 in Ukraine. Just as with Mr. Shevardnadze, I’ve been severely disappointed with Mr. Poroshenko’s apparent inability to see that the status quo is unsustainable. Ukraine needs real change, not an imitation of it. Today, many of the reform initiatives we began have come to a halt. Just this week, Ms. Marushevska resigned from her post. After my repeat experience here, I decided to resign to found a new political party in Ukraine. This is an amazing country, full of hard-working, educated and talented people who deserve a much better future. Its greatest resource is the young, educated Ukrainians who, given the opportunity, would become effective, honest public servants and political leaders, eager to rid the country of corruption. Until now, Ukraine’s old corrupt establishment has discouraged and blocked these young reformers from assuming leadership positions in the public sector. I am pledged to help change that. Mr. Shaakashvili has offered a number of excuses as to why he has not been able to deal with corruption in his "oblast", but does little to shed light, or even to support his position on why "Ukraine is losing the war on corruption". His biggest complaint seems to be that he has not received the support he needs from the central government in Kyiv...in fact, some of the people in the president's own party have been frustrating his efforts. But what did he expect? That all those corrupt power centers that have been pillaging the country for a quarter century, would now embrace his efforts? It took the prime minister of Singapore (a tiny country smaller than Kyiv), with all his authority and single-minded focus on corruption ten years before there were appreciable improvements. Did Mr. Shaakashvili expect that in less than two years he would clean up one of the most corrupt oblasts in Ukraine? Has anybody ever succeeded in such a short period - through cumbersome legal procedures - in turning around such a deeply ingrained culture of corruption and in destroying the various layers of interlocking networks fighting to preserve the status quo? For someone who claims to have succeeded in Georgia, he should have known what kind of firestorm he would run into before taking the job. Even Poroshenko can not, by simply waving a magic wand, force Parliament, the courts, and the prosecutors to act more swiftly and with integrity. Only a dictatorship yields quick results. Ukraine has made great strides towards fighting corruption. Even the e-declaration of personal wealth by the top political elite in Ukraine (including the president) should have convinced him of this. The scandalous admission of huge amounts of un-explainable wealth in the hands of so many public officials is, in itself, perhaps the best evidence of how far Ukraine has come. Both the prosecutor's office and the National Anti-Corruption Bureau are now moving to investigate such dubious acquisitions. How many countries in the world had ever been able to pass laws requiring such declarations? And yet, Mr. Saakashvili claims that the mere exposition of such ill-gotten wealth caused him to leave in defeat. I think Mr. Saakashvili may have been more interested, all along, in trading his reputation as a reformer for higher elected political office, rather than hands-on, daily, patient struggle with the looters in his oblast. No, the war against corruption is not lost. In fact, it is picking up strength, despite the resignation of so-called "reformers" and despite the predictable reality that corrupt power centers will do all they can to abort it. But it may takes a tougher and more determined breed of reformers to win it. George Woloshyn you are mistaking from very beginning to the very end of your comments. Keep your mouse shot on the topic that you have no clue about, so-colled expert. Since you imply that you have expertise on the "topic", would you elaborate, rather than simply excoriate? Specifically, you state that the comments are "mistaken from the very beginning to the end" - please show the errors you find to be most egregious. I will try to find time to elaborate, since I am not employed for it. Mr. Saakashvili and group of his reformers. What is the "truth" that I twisted? I simply stated a reasonable conclusion.....that a reformer with experience in fighting corruption in his own homeland should be aware of the difficulties and the time needed to achieve success, and should have known that there would be enormous counter-efforts. If, after 2 years, he walks away and expresses a desire to set up his own political party (despite some reports that the president may have offered him the opportunity to head up the president's party) I am justified in drawing the conclusion that this may have been a priority. The appointment, for example, of a 24-year old woman with an educational background in literature and no prior experience in civil service or Custom to a position that requires the toughest of tough managers in dealing with the mega-corrupt Customs Office in Odessa is hardly indicative of Mr. S's seriousness. Like everyone else who heard Ms.Marushevska's wonderful and impassioned appeal in the video "I Am a Ukrainian", I fell in love with her :), but to throw her into a den of vipers and then complain that he is not getting support from Kyiv is nonsense. I will make an effort to unroll each of your twists of truth as you wrote it. 1. Quote: "Mr. Shaakashvili has offered a number of excuses as to why he has not been able to deal with corruption"
1. Mr. Saakashvili not Shaakashvili. It is not possible to get read of corruption in separate region (oblast') when whole country including Presidents party is corrupt. If you know any example please tell us about it. Mr. S's goal was to show some steps that reformers at central government should take. Mr. Saakashvilli was in his position in Odessa for one and half ear. For the first year all hid major projects was sabotaged and blocked by the government in Kiev. What projects Mr. Saakashvili started? 1.Maintenance of Odessa Renie highway which should allow container traffic in line with "silk rout"; 2.Public service office; 3. Odessa Custom center, which had to bring money for highway maintenance; 4. De monopolization of airfare prices from and to Odessa; 5. New airport construction; 6. City police reform; 7. Governor's office assistance to small businesses; and I could go on. I would start with Odessa Custom center and Marushevska's appointment. It was promised by government to let Governor's office to keep 50% of Custom's center money for road construction and maintenance including Odessa-Renie highway. First thing that government did is took away from Custom center energy unit which generated 50% of its money and re-routed custom traffic to other custom centers away from Odessa. Preliminary Custom center reform in Odessa required to fire every one, install computerized and automated Custom system and hire honest people who will have no related education, in addition except only loads from not corrupt shippers. For the first six months government in Kiev did not allow to fire corrupt workers. Work of Roman Nasirov and others. After appointment of Marushevska, she was able to hire good people for minimal pay. After few months Mr. Nasirov took away ability of Marushevska hire and fire Custom workers. Money for automated Custom system was promised by the government and never delivered on the promise. Your points are well taken. And, although it may have come across that way, I did not intend to diminish Mr. Saakashvili's accomplishments or even his intentions in taking on one of the most difficult, corrupt, and alienated (from Kyiv) regions of Ukraine. I'm sure he did the best he could under the circumstances, and I have no doubt that any effort at reform would have been met with strong resistance both locally and in Kyiv where crooked government officials and parliamentarians await the stream of corrupt revenue derived from Ukraine's busiest port. What I find objectionable is that good people (like Mr. S) and other reformers have been prone to resign from their positions after a year or two while accusing the government in Kyiv of failing to support their efforts or even sabotaging them. No one in Ukraine - not even the president - can provide the kind of support that is needed to facilitate reform efforts throughout Ukraine. And even if the president wanted to come to Mr. S's support, he would have to give serious consideration to the ramifications of maintaining some level of unity and stability in a country at war. The simple fact of life is that oligarchs control major parts of the Ukrainian economy and wield disproportionate power in Parliament. Those are the power centers with which he has to contend.It is a situation of damned if you do and damned if you don't. In today's world, the job of president of Ukraine may be among the most difficult and complex in terms of the hoops and hurdles that he has to pass through, while, at the same time, preserving Ukraine's independence and territorial integrity, even at risk of deferring an all-out war with corruption. Perhaps his only recourse is a slow but steady ("stealth") war against corruption which will make it increasingly harder to initiate and maintain corrupt "schemes" but deferring forceful measures against those currently in play. Just as you took offense at what you saw was my failure to fully acknowledge Mr. S's positives, I took offense at Mr. S's characterization of "losing" the war against corruption. The simple reality is that there have been very great strides - at the national level -in the fight against corruption. The war is not being "lost"; it has only begun, even though its speed and progress can never be "sufficient" and it will not proceed in a straight line but only as a zig-zag. It takes patience and it takes persistence and, most of all, it takes a willingness to stay the course by those who have come in as reformers. Every executive position carries with it certain authorities and powers which may not be adequate to achieve desired results, but can be used in leveraging support and out-maneuvering the opposition. After merely a year and a half on the job - with much of it used in simply becoming familiar with the incredibly byzantine and hidden "lay of the land" - I find fault with his leaving his post because of Kyiv's failure to support his efforts. If Ukrainian soldiers in the "other" war further to the east were to follow his example, would there be anyone left to defend the nation? No one should accuse Ukrainian people for not having enough patience. Quote: "It took the prime minister of Singapore (a tiny country smaller than Kyiv), with all his authority and single-minded focus on corruption ten years before there were appreciable improvements." Well said, there is one big but, when prime minister of Singapore begone fight against corruption first thing he did, he jailed his own brother because his brother was involved in corruption scams, so prime minister did with other corrupted politicians, and it took him ten years to succeed. In Ukraine Mr. Poroshenko have not jailed no one for two years, with such start people will grow out of patience and they will turn back to Russia and old way of living or it will cause another popular uprising which will be very violent. It took Mr. Poroshenko whole year in power to fire most corrupt prosecutor general Mr. Pshonka, at the same time as soon as prosecutor in Odessa Mr.Davit Sakvarelidze got on truck to nail corrupt group in Odessa Mr. Poroshenko fired him (the most honest prosecutor) to protect his own interests. At least seventy percent of President's Mr.Poroshenko party is corrupt and he do nothing. No one in more or less significant position of government is jailed despite all the arrests that are continue currently. It is morally wrong and criminal not to change current laws in Ukraine which designed for corruption to proliferate. Early parliamentary election must happen in Ukraine to help President (if he really interested) to change the laws and begin actual fight with corruption. You must be thinking of Victor Shokin who was appointed Prosecutor General for 13 months by Poroshenko. Pshonka had left the Prosecutor General post months before Poroshenko had been elected president, and you are right - Pshonka was probably the most corrupt of a whole line of corrupt prosecutors. Although Shokin was widely (and accurately) regarded as someone who obstructed the prosecution of high-level cases originating from the Yanukovych Administration, the opposition to him was based on his obstruction of reform, not on any evidence of corruption. After he was dismissed from his position, private investigative reporters found a residence in Austria that he and wife (a doctor) owned valued at a half million dollars, and there was some short-term speculation as to how they could afford such a residence on their income. I am not and have never been an apologist for Poroshenko or his Administration on the issue of corruption. But I have had considerable experience with the difficulties involved in uprooting corruption to understand the limits of presidential power and the difficulty of finding individuals who are not only honest but have the expertise in carefully probing through the layers, networks, blind alleys, and outright destruction of evidence, intimidation of witnesses, and whole-scale buying of the courts. Furthermore, I have a keen understanding of how difficult it is to bring powerful criminals to justice under conditions that are imposed by western mentors and donors: rule of law, due-process, litigation, appeal. etc. And, of course, I assume that a billionaire like Poroshenko who would have had long-standing relationships with other people of wealth and power would not be eager to see them prosecuted. But - at the end of the day - the most important priority for both the president and for Ukrainians is to defend their independence. History is full of examples of countries with age-old traditions of corruption fighting and preserving their independence, but none that were cleansed of corruption after succumbing to an equally corrupt predatory, alien power. The civic momentum against corruption is strong and is not likely to be thrown off course if the country's priorities are focused on reclaiming its eastern borders for another year or two. Most foreign observers acknowledge that Ukraine has made great strides in its laws, in its new, anti-corruption instrumentalities, in its reform of some of its most corrupt economic sectors, in its transparency, in its reform of the bureaucracy and special emphasis on prosecutors and the judiciary, while, at the same time building a powerful military almost from scratch, and maintaining the trust and confidence of a great many global supporters. That is something that Ukraine never had prior to the 2+ years of the Poroshenko Administration. Ukrainians are too eager to find fault with their leaders while failing to see the positives.....all of which plays into the enemy's hands who exploit these popular sentiments to weaken governments. It would be far, far better if Ukraine were to show greater progress in fighting corruption while standing up to the Russians in the East. But Ukraine should not throw the baby out with the bathwater. I still believe that aside from all the difficulties faced by Ukrainian Government its President should not close his eyes on the fact that his party members seat on peoples money streams. Much more of Ukrainian advanced weaponry should go to front line, like anti tank weapon Corsar. Mr. Avakov must resign for corruption allegations. Oдесский припортовый завод should not be artificially brought to bankruptcy and locally developed soft wear should be used for transparency in privatization. In addition it is very important to change election rules to prevent blind grab of power by major player with mass media resources. You are absolutely correct. I spent a goodly portion of my career in positions intended to both prevent and interdict corruption. And I am very much aware of the huge loss that it brings to society...not only in direct monetary plunder, but in placement of incompetent friends and relatives in positions of public policy and trust; and in weakening a nation's loyalty to its state institutions. Ukraine, by all objective standards, should be the "miracle" of Europe in terms of its economic prosperity and preeminence. Instead it is forced to go from door to door seeking alms. If it were up to me I would declare a state of national emergency resulting from the disastrous effects of corruption in Ukraine and go after these blood-suckers hook, line, and sinker. Unfortunately, the consequences of such precipitous action - in time of war and under conditions in which the Kremlin is always looking for "troubled waters" in which to fish - may prove to be more destabilizing than the country can afford. The pace of reform and anti-corruption can and should be increased, though one major stumbling bloc is finding qualified replacements for the corrupt officials dismissed from their jobs and paying incoming officials salaries and benefits that would deter them from corruption. Even now there are openings in the judiciary, but very few candidates. The "decentralization" of power and responsibility to the regions which was put into place only 2 years ago is another hurdle because now revenue is being raised and dispensed directly by local authorities, and who has the ability to monitor all of them? And how do you get people to vote for honest, well-meaning reformist parliamentarians instead of accepting bribes for their votes or simply voting for candidates who are nothing more than pigs with lipstick? Despite all this, it will be impossible to put the genie back in the bottle. The momentum of civic society, media, academic institutions, and the younger generation is solidly towards ridding the country of this pestilence. While the Poroshenko Administration has approached this task with hesitation and discomfort, it has, nevertheless, produced - at least minimally - what the West has demanded in exchange for its continued monetary support. The infrastructure that it has put into place will make corruption less likely but it will take time - longer, perhaps, than would be necessary if this were the government's top priority. I believe that history will judge the current administration and President much more favorably than the current generation of Ukrainians, and, perhaps, when the war is over and the fight against corruption takes on more steam and begins to produce more tangible results, he will be recognized for the good he has done rather than reviled for his lapses. You speak wisely and pacifying, I am sure you have practical experience in dealing with corruption, many thins you address is very much correct, but for me with all his mistakes and over doing Mr. Saakashvili is number one reformer and corruption fighter in the world. With all positive things that Mr. Poroshenko is done it is nearly not enough. Within next eight month early parliamentary election in Ukraine may happen and then there is a chance to make radical steps to re-direct streams of money from oligarchs to government and as a result go public services in increase in salaries of government workers. These steps will create some corruption deterrent and allow Ukraine stop borrowing from IMF an free future generations from financial slavery. Mr. Saakashvili has vision, has proven himself capable of defeating corruption in Georgia, respects and admires Ukrainians, has credibility with many western leaders and the Ukrainian electorate, and has no love for Putin. In other words he has all the attributes that I would consider of greatest importance to succeed Mr. Poroshenko. The latter has run a good race under circumstances that would crush a lesser man, and perhaps it is time for him to pass the batton to the next runner. As I have stated previously, I believe that Mr. P has earned a place for himself high on the list of Ukraine's great leaders. If Mr. Saakashvili should win, I will be no less pleased than you. 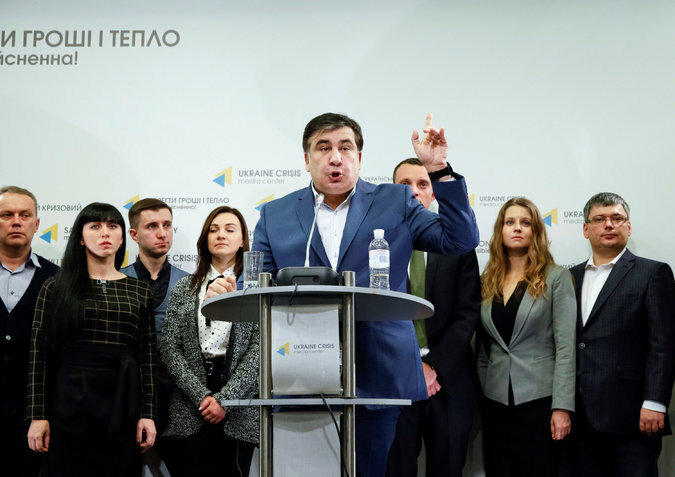 For Saakashvili to succeed the election law must be changed to forbid votes by Party Lists. I am not clear on details but, those familiar with such as Ukrainian congressman Viktor Chumak should get as much support to make those changes happen as he can get. It was pleasure to converse with you. Although we may agree that Mr. Saakashvili would - at least on the basis of his past performance and qualifications - make a suitable successor to Mr. Poroshenko, I think we would disagree as to timing. Mr. Poroshenko was elected for a term of five years which ends in 2019. He has served less than half that term, and has accomplished extraordinary and necessary structural changes and improvements during that period, but already Ukrainians are looking for replacements. Mr. Saakashvili left his post after a mere 13 months with very few accomplishments in that office (excepting the well-meaning and notable efforts you listed), and already he is urging that Mr. Poroshenko's term be cut short and is promoting himself as a better candidate. Mr. Saakashvili would have had the opportunity to clean out corruption in Odessa concurrently with the end of Mr. Poroshenko's term as president. By the end of Mr. Poroshenko's term of office, Ukrainians would have the evidence of a growing economy; a more stable government and society subject to rule of law; an energetic and ongoing prosecution of corruption and very much reduced opportunities for corruption; and, if not restoration of Ukrainian control of its borders, at least a Ukrainian military strong and confident enough to deter any future threat. These are not my musings, but the expectations of western governments and experts that continue to provide diplomatic and financial support precisely because they are working closely with the Poroshenko Administration and see the progress, the trajectory and the results. Mr. Saakashvili would better serve himself and the nation if he were to spend the next two years exerting steady pressure on the Administration to clean the stables while building up his party and his campaign in preparation for 2019. The pace of reforms in Ukraine are satisfying western government for its convenience as for instance Mr. Putin is very well convenient President of Russia in the yeas of western governments if not for his international adventures such as Syria and invasion of Ukraine. If not for those things he would be perfect partner for the west. But, who cares for the people. For Ukrainian people these changes are mediocre and Mr. Saakashili is interested in much fester reforms and not in presidency for it sake. He never mentioned that he intend to compete for presidency in Ukraine that is my pure wishes. I have high respect for Mr.Saakashvili because he does what he says he will do. I can not say the same about Mr. Poroshenko. I my self supported candidacy of Mr. Poroshenko for president, because compering to others he look best but not nearly enough. There are many many good honest educated and qualifying people in Ukraine who would do much better job for Ukrainian people if they are exposed and promoted as politicians. I am not against Mr. Poroshenko but he must in the shortest time possible show that he can do better or people will not wait as they did not wait with Yanukovich. I fear you may be right, Mr. Skakovsky. While any form of internal instability resulting from political campaigns and transition may prove damaging to Western confidence in, and support for, Ukraine and open opportunities for Russia, failure to address poverty, corruption, and popular perceptions may lead to equally disastrous results. Either direction has its risks, especially at a time when continued EU and US support can no longer be assumed. The best solution, of course, would be for the Poroshenko Administration to adopt a more pro-active and vigorous approach to corruption and reform, and recover many of the billions that have been plundered from Ukraine. Or, in the alternative, for the credible "loyal opposition", such as that of Mr. Saakashili, to insist on conducting a "positive" rather than a negative campaign......one of offering solutions and realistic promises rather than simply discrediting the current Administration. The conduct of a campaign within a highly polarized and impassioned environment can do much to stabilize or destabilize the situation. If Mr. Saakashili is the type of person you believe him to be, Ukraine's well-being rather than his ambitions should be his guide. Ukraine's stability is Mr. Saakashvili's goal which can be achieved through speedy such as 8-10% GDP growth. Current Administration do not even plan for such scenario, their prognoses 1.5% for next two to five years. With such stability Ukraine may get to Yanukovich level of economy in the next 15 years. Not good at all. If I gave you a dollar for every promise a politician ever made for economic growth, you would be a very rich man. Even Trump -who has not been a laggard when it comes to making very extravagant promises - has stopped at 4% growth for the U.S.. While I realize, of course, that Ukraine is starting from a much, much lower base, 8-10% GDP may be a bit of a stretch. Ukraine's average growth rate over the last 16 years averaged 2.5% (inclusive of the severe economic losses resulting from the war). Starting with the first quarter of 2015 (when the economic decline was at its worst,minus 17%) until the present time (when the growth rate has increased to plus 1.8%) I would conclude that the nearly 20% turn-around in less than two years is equivalent to Mr. S's 10% per annum. Mr. Poroshenko's forecast of further growth is based on the IMF's conservative estimate, and takes into consideration the continued drag of the war on Ukraine's economy, the need for massive social redistribution programs, and the continued reluctance of investors to invest under conditions of war and corruption. Although it may be argued that Mr. S. will be more reassuring to investors as regards increased efforts at fighting corruption and other business-friendly initiatives, it may take some time before these programs come into effect and businessmen gain confidence. Promises don't cost anything....but for a nation that has been lied to for centuries, Mr. S should be very careful in ensuring that he can deliver. I have my doubts. Mr. Woloshyn your economic evaluation is insulting, you should not mix apples and oranges. Official Ukrainian statistics for last thirteen years shows average 3.9% GDP growth. First quarter of 2014 or last quarter before election of Mr. Poroshenko shows GDP growth of 2.4% and for all 2014, 2015 and 2016 average GDP growth is negative or -4%. I may assume that when you mention economic losses of 17% you are talking about decline production in industrial sector, I can except that. Please, we are discussing GDP. So, as you can see above I gave Mr. Poroshenko extra 2.4% GDP growth in 2014 prier to him becoming a president. If we would look at pure time of Mr. Poroshenko presidency GDP growth it is negative more than 4%. Once again it is not +10% average it is minus more than 4%. For those familiar with real information about GDP growth and for a Country as Ukraine with its potentials to be in big 13 or 13 most industrialized Countries. I did not make mistake, it is not big 20, Ukraine has bigger potentials. GDP growth of 8-10% is modest and very real. Please keep your dollar, Mr. Saakashvili put his money where his mouth is, and do better home work next time before throwing these numbers at me. I'm not sure I know what you mean that Mr. S "put his money with his mouth is". I have yet to see "the money".....unless, of course, you mean hypothetical promises that are the staple currency of all politicians seeking higher office. Yes, I was not polite, and you are correct, numbers could be cooked. I prefer to use public information and do not like conspiracy theories for the reason that, there is never end to human imagination. I have no intent to argue. My believe Mr. Saakashvili could deliver on his promise and economics do show such reality. Thank you for youer patience. I am resigning from farther discussion on this topic and would agree to disagree. I, too, would like to "sign off". Our host, Mr. Nicholas, has been more than patient in allowing such an extensive dialogue, but valuable points and counter points were raised for the benefit of those who have not given much thought to these issues. Mr. Skakovsky....you need not respond, but I simply wanted to acknowledge my error in misinterpreting some economic data. Ukraine's GDP has dropped sharply (nearly 20%) during the 2.5 years of the Poroshenko Administration and has begun to show some growth only in the last few months. You were right in challenging my earlier assertions of vigorous growth. However, at risk of restating the obvious...the loss of Crimea and a substantial part of Ukraine's industrial base, combined with the costs of war and rearmament, and the need to provide some basic support to nearly 1.8 million internally displaced persons can not but adversely affect a nation's GDP. The main goal of Ukrainian President should be deregulation of economy and rapid changes of Ukrainian law which is being setup as a haven for the corruption. Fighting corruption is important but, it is more important to illuminate the laws that allow for very corruption to prosper. At this point fighting corruption is like taking pain killing pills without healing the cause of pain, it will go on forever and only makes one become dependent on such pills and stay sick for an endless time. The worth that can happen now is if people come to power and appoint honest ones to run the government without changing the current law, it will be a total disaster. I wont to stress out again the importance of deregulation of economy, lowering Tax and changing current law as a main goal that President should do first, while he has relative unity in government and parliament. Glad to see that we can agree on this, Mr. Skakovsky. But a goodly amount of the current administration's efforts has, in fact, (under prodding from the IMF, EU, and US) been directed towards this end. Large sectors of the economy such as Energy and Finances as well as part of its law enforcement (the police) have been "reformed" and now Health Care seems to be advancing under the very tough monitoring of the American physician who was put in charge of that Ministry. And the requirement for public bidding on contracts is already producing excellent results though this has not gone as far as it should. Keep in mind that, in Ukraine as in any democratic country, laws are changed by the legislature and most of that legislature still sits in the pockets of those who seek to benefit from existing opportunities. Poroshenko may have been entirely justified in seeking to bribe many of the delegates because nothing else could have compelled them to vote against their own interests or that of their sponsors. Our disagreement is not on the continuing huge amount of corruption that can still be found in the country. Our disagreement is with the speed with which the cleaning up can be and is being done. Having dealt with public bureaucracies and the long lead times needed to pass good laws that would impact one or another industry group or special interest on behalf of a public interest, I tend to be a bit more realistic in assessing progress and difficulties. In Ukraine, the same difficulties that face any relatively honest and benign government in the west are magnified multifold. That is why I give the current Ukrainian administration more credit than most Ukrainians are inclined to give. Yes, our disagreement is with the speed with which new law are introduced and the speed with which corrupt politicians are prosecuted. Behind closed doors dealing should stop. Speaking of witch, early parliamentary election would do the trick, assuming election law is improved. This is exactly what Mr. Saakashvili is proposing, to bring young, talented an honest people to parliament and finally move to parliamentary Republic as it is stated. New move by President Poroshenko to install over viewers for all ministers is not an appropriate thing to do. It is a copy of V. Putin power consolidation as he implemented at the beginning of his presidency. Ukraine do not wont and should not be allowed to go the same way as Russia did. While Mr. Saakashvili is highly regarded for his ability to clean up much of the corruption in Georgia, many critics fault him for using heavy-handed methods, including excessive executive authority. So his alleged interest in a "parliamentary republic" (as contrasted with a "presidential republic") is a reversal of his prior activities in Georgia, as is his accusation of Poroshenko's monitoring of ministerial performance. In a country like Ukraine, where corruption is so ingrained and endemic, there may be good reason for granting more power to the president, because I am convinced that parliament will not take appropriate action. And the appointment of "monitors" may be either good or bad depending on their purpose. If I were president who had to put up with widespread corruption among the ministries, I would have been inclined to appoint monitors to ascertain that corruption is being terminated. The replacement of ministers is always a very dubious and difficult position and has to go through a corrupt parliament .....perhaps the next best alternative is to keep an eye on them. To assume that Mr. S will change the character of parliament because of his election as president is nonsense. Ultimately, it is the voters who will decide whether they will vote for "young, talented, and honest" representatives and reject the ones who know how to buy their votes or spend the most money on their election. Ukraine's track record in this regard is not very good as they keep returning some of the most corrupt politicians to office....including those who employ them in their districts. Other than success in tiny Georgia, where much of the political and economic elite was already predisposed towards reform, I don't see any great reason to embrace his candidacy or view him as the great dragon slayer that you believe him to be. He achieved almost nothing of lasting importance in Odessa, and spent much time promoting himself and seeking good PR opportunities to advance his political career in Ukraine. But I see a great deal of progress that has been done by the Poroshenko administration in a host of areas. Whether progress has been fast enough is a subjective issue.....to an outsider it is never enough. But the only fair way of assessing this would be to get in there with the president and his staff and see what he has to deal with. Perhaps such progress as has been made is really very good. Mr.Saakashvili does not accuse Poroshenko in monitoring ministerial performance, I do. As we all can see on Russian example such appointments are used to redirect some percentage of total income through those appointee who and to who knows for whom, influence decision making process of executives, and simply presidential personal control. You know, for that mater if you do not like me comparing decision of President Poroshenko to Mr. Putin, you can draw direct parallel to Stalin, who had Commissars installed to all levels of enterprises, military units and practically in every social group. I agree, you have expressed total none sense when you said that respected Mr. Saakashvili would run for President, get elected and then change the character of parliament. One more time, I agree, NONSENSE. Respected Mr. Saakashvili is proposes to the society to put pressure on President Poroshenko to call for early elections of parliament (as I mentioned before, assuming the election law will be changed by then) and honest representatives of all ages should be chosen by people (new election law would allow people to propose their own candidates on all levels) those who did not serve more than one year in Parliament in the past, in other words majority of elected should be new people who are "clean" from the start. Ukraine and Ukrainian people do not need Presidential Republic which always has a chance to slip into dictatorship. Constitution of Ukraine spell's out Parliamentary Republic and let it be. It will not take too long for newly elected Parliament to impeach president and elect some one who deserves to be called Ukrainian President with Capital Letter and lesser power. It is disrespectful to Ukrainians to blame them for their choices, their track record as is, due to the foul kind of law, which does not allow people to bring some one known to them, some one from community who would possess proper education, how is respected and is not part of "old political elite". People made their choice when they came to Mайдан and kicked Yanukovich out, now they should express themselves peacefully unless, there is no response to their demands then, it is up to people to decide what to do. Bank and out of the Country, now they will get all kind of favors from those individuals well, if Mr. Poroshenko gets the benefits, perhaps he should pay for it. Let's say from the sale of the Roshen business or what ever. For the record: It is humiliating and diminishing of Georgians and their achievements together with Mr. Saakashvili to say, tiny Georgia, that's for start. Political and economic elite was not ready and was not predisposed towards reform, I personally new many of them. Georgia was MOST CORRUPT republic out of fifteen Ex-Soviet Republics, I lived there, I have served in Air Force in Ex-Soviet Union and a specially in Ukraine. Many from political elite was dismissed and many from economical elite jailed by Mr. Saakashvili. It was and it is a Big Deal! That is good example to any country small or United States perhaps. For smart people it is never and should never be embarrassing to adopt good experience, dose not matter how small or insignificant he may sims or his Country sims to be. "Progress" of Poroshenko as we say like eating diner with one tea spoon per hour, in my opinion it is to little at a time. People of Ukraine should say LOUDLY to Poroshenko and his "willing and dealing" bodies to GET OFF the public money needle. The accusations of corruption to Poroshenko's closest associates are so multiple I will need an additional page to list it, and I am not the right person to do that. People of Ukraine will tell, they will present their fee. For those in Ukrainian Government who care.